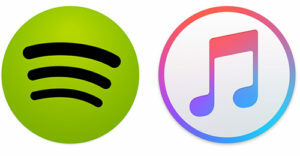 There are a few ways of downloading music to your iPhone, using either a paid streaming service or a file downloader. You can download thousands of songs to your phone via Spotify or iTunes, by having a paid account and selecting playlists/albums/etc. for offline use while on your computer. Then, simply open the app on your iPhone. If you want to download specific music files (like mp3 or m4a), you can use Total Downloader.